*This is not limited to BarTender documents, but also database files, folders being scanned for trigger files, external image files, etc. Print Station (BarTender does run in the background in such a context). 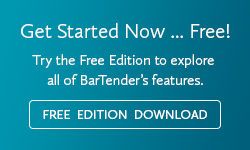 When automating BarTender through our .NET SDKs form a service type application. The most important thing to understand when working with mapped network drives is that they are strictly "user defined"; which means that they only exist on that user's context, or that different user could have the same "letter" mapping different network resources. Not only that, those mapped drives are only initialized when the user actually "logs into" the computer. Considering the above, and as a general rule, all resources meant to work on a service or mutli-user context MUST be defined using their Universal Naming Convention (UNC) path: \\ComputerName\SharedResource.